THROCKMORTON, James Webb, a Representative from Texas; born in Sparta, White County, Tenn., on February 1, 1825; attended the common schools; moved with his father to Collin County, Tex., in 1841; studied medicine in Princeton, Ky., and practiced in Collin County; served as surgeon during the Mexican War; studied law; was admitted to the bar and commenced practice in McKinney, Collin County, Tex. 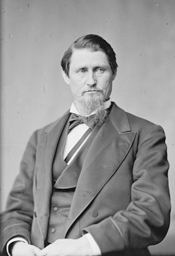 ; member of the State house of representatives 1851-1856; served in the State senate 1856-1861; member of the secession convention of Texas in 1861; during the Civil War served as captain and major in the Confederate Army from the spring of 1861 until November 1863; brigadier general of State troops in 1864 and commander on the northwest border of the State; again a member of the State senate in 1865; delegate to the reconstruction convention under President Johnsons proclamation and chosen the presiding officer of that body in 1866; elected Governor of Texas and was inaugurated August 8, 1866; removed by order of General Sheridan August 9, 1867; resumed the practice of law in Collin County, Tex. ; elected as a Democrat to the Forty-fourth and Forty-fifth Congresses (March 4, 1875-March 3, 1879); chairman, Committee on Pacific Railroads (Forty-fifth Congress); was not a candidate for renomination in 1878; resumed the practice of his profession; elected to the Forty-eighth and Forty-ninth Congresses (March 4, 1883-March 3, 1887); chairman, Committee on Pacific Railroads (Forty-ninth Congress); declined to be a candidate for renomination in 1886; unsuccessful candidate for election as United States Senator in 1881; resumed the practice of law; delegate to the Democratic National Convention in 1892; died in McKinney, Collin County, Tex., April 21, 1894; interment in Pecan Grove Cemetery. Howell, Kenneth Wayne. Texas Confederate, Reconstruction Governor: James Webb Throckmorton. College Station, TX: Texas A&M University Press, 2008.